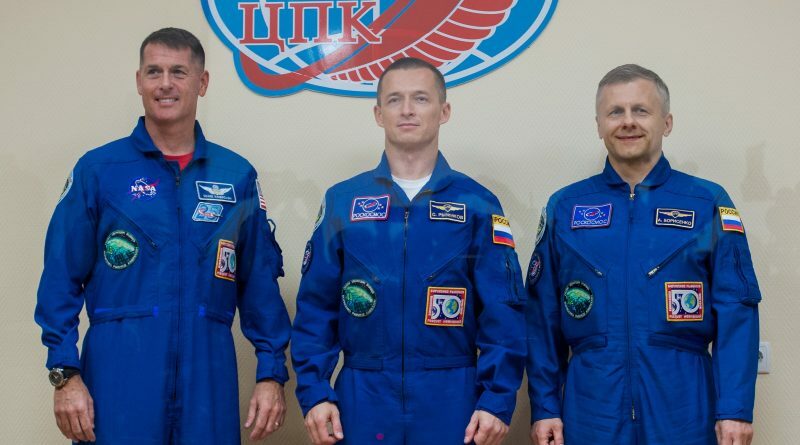 Rookie commander Sergei Ryzhikov and veteran Flight Engineers Andrei Borisenko and Shane Kimbrough are working towards liftoff from the Baikonur Cosmodrome at 8:05 UTC to enter a two-day trek to the Space Station for arrival on Friday. The crew of Soyuz MS-02 will increase the population living off Earth to eight, joining the resident Station crew and a pair of Chinese Astronauts who launched into space on Sunday and arrived at the Tiangong-2 space laboratory on Tuesday. However, this number will not stand for long as the Expedition 49 crew members will be forced to make a quick handover before the current Station crew departs to close out their mission with an early morning landing on October 30. 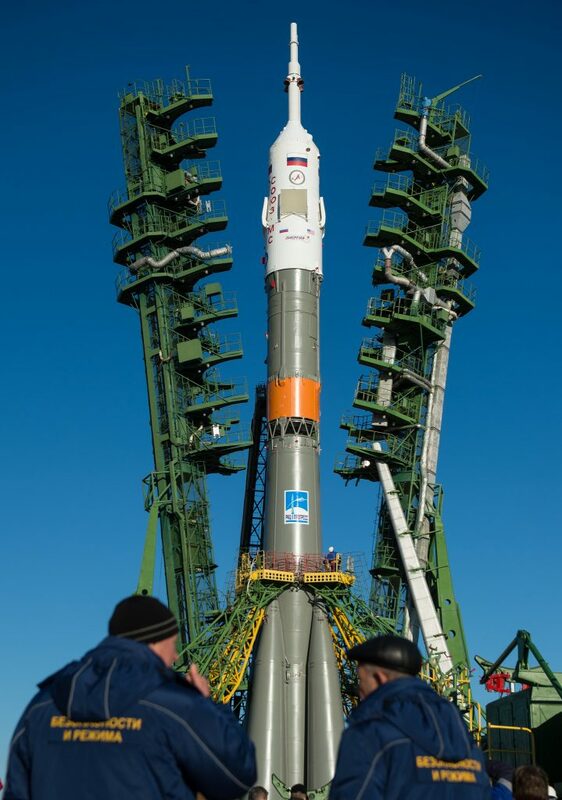 At the Baikonur Cosmodrome, preparations are progressing on schedule toward a liftoff at 2:05 p.m. local time. Soyuz FG has been undergoing detailed testing since Sunday morning’s rollout to the launch pad before heading into preparations for the eight-hour countdown sequence. Soyuz received its traditional pre-flight blessing given by an Orthodox Priest – just one of many traditions in place at the Baikonur Cosmodrome from where crews have been departing to space for over five decades. 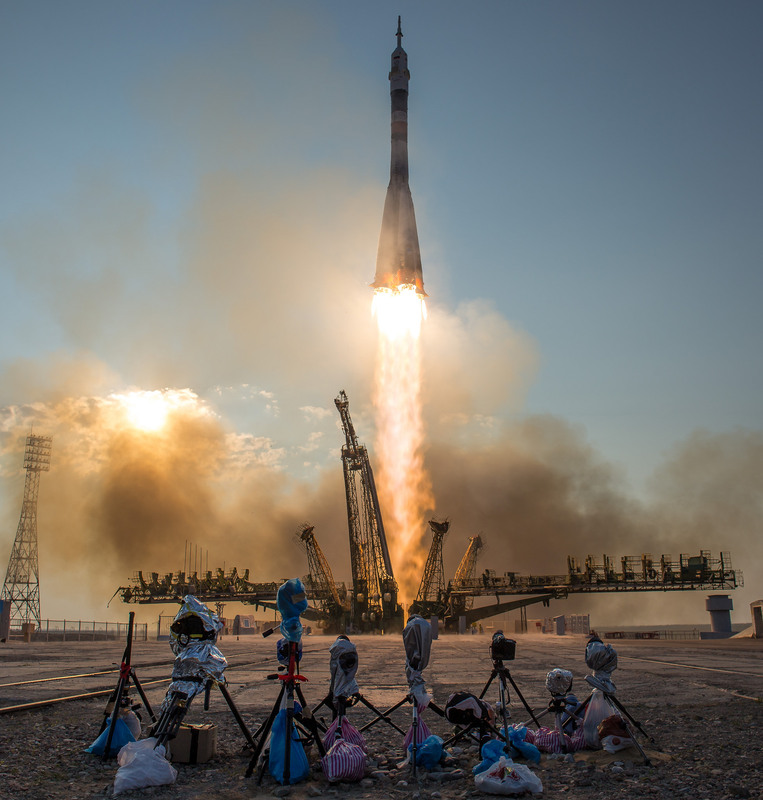 The three-man crew was officially approved for flight by the Russian State Commission Tuesday evening before participating in the pre-launch press conference at Site 254 of the Cosmodrome. Afterwards, the crew turned in for a final night in the comforts of gravity with their alarm clocks set for around nine and a half hours before their T-0 time. 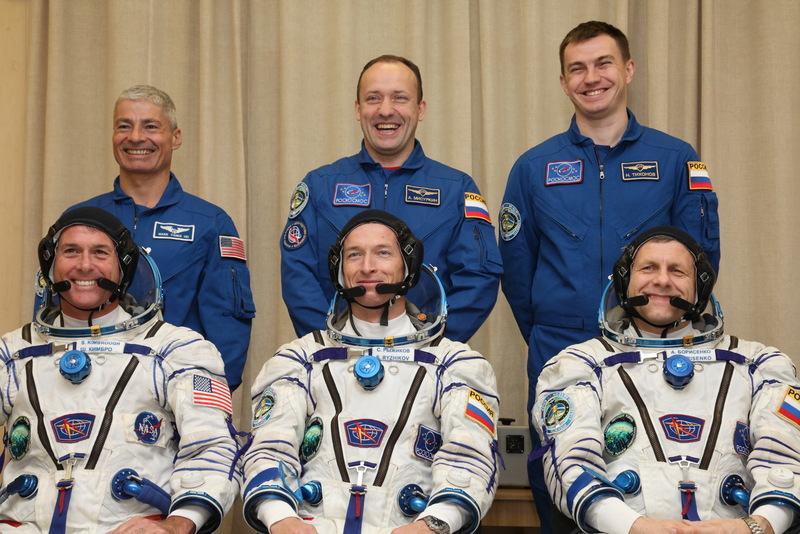 Because this launch uses the launch pad at Site 31/6, some changes are necessary to the crew’s countdown due to the longer bus ride from the suit-up facility out to the pad. Normally used for crewed launches, Site 1/5 is unavailable for this and the next Soyuz launch due to ongoing maintenance and outfitting work. The crew will depart the Cosmonaut Hotel at L-6.5 hours to head over to Site 254 for a final medical check and to ingress their Sokol Launch and Entry Suits. Out at the launch pad, Soyuz FG will enter propellant loading five hours before launch following a final review by the State Commission. A one-hour bus ride will take the crew to their fully-fueled vehicle, arriving at the pad at L-2.5 hours to enter their seats atop 274 metric tons of explosive rocket fuel followed by a final checkout phase on their spacecraft leading into the automated countdown sequence to ready the 49.5-meter tall rocket for blastoff. Rising from its launch pad under the loud thunder of its four-liquid fueled boosters and core stage, Soyuz will swing to the north-east to deliver the crew into the orbital plane of the Space Station. The force of raw rocket power will fade to the sensation of weightlessness eight minutes and 45 seconds after liftoff when Soyuz MS-02 and its crew trio arrive in orbit. The crew will be set for a two-night stay in the confined space of the Soyuz spacecraft, moving into the Orbital Module shortly after arriving in space. A pair of engine burns is planned for their first day in orbit with another to follow on Thursday to begin climbing toward the Station’s 400-Kilometer orbit. Although the mission sticks to the longer two-day rendezvous, the crew will not have much free time as a series of testing activities are on tap to put the newly introduced Soyuz MS systems through their paces in an operational flight environment. Soyuz will arrive in the vicinity of the Space Station Friday morning, firing its engines multiple times as part of a fully automated orbital link-up. Back in their seats inside the Entry Module, the crew hopes to oversee a fully automated docking to the Poisk module of ISS at 9:59 UTC to join the Expedition 49 crew aboard the orbiting complex. Expedition 49 will only continue for nine days after the crew’s arrival, creating a busy schedule that will also include the arrival of the recently launched Cygnus OA-5 cargo vehicle on Sunday after it has to loiter in an orbital parking space to give priority to the inbound Soyuz spacecraft. Out at Site 31/6, engineers will initiate the countdown sequence around eight hours prior to launch with the final set of fueling preparations. 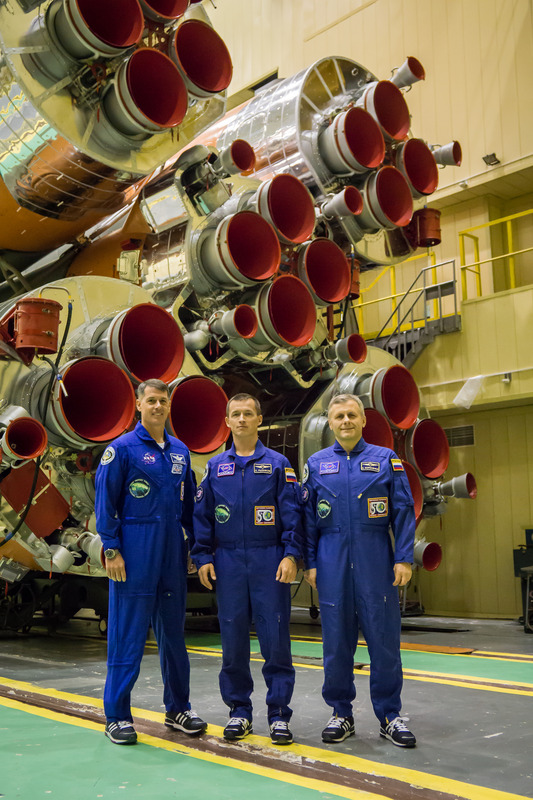 Once the two vehicles are activated, the Soyuz rocket and spacecraft complete a series of checkouts – communication checks, electrical testing and propulsion system testing is performed in the early stages of the countdown. Completing final hands-on work on the launch vehicle, engineers will install batteries in the booster and remove protective covers before standing by to receive a GO for propellant loading. 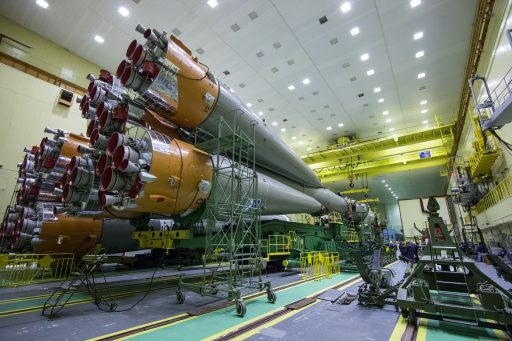 Five hours and 30 minutes ahead of launch, the Russian State Commission will meet to look at the overall status of the countdown and the results of launch vehicle and spacecraft testing to provide official approval for the beginning of the Soyuz propellant loading sequence. By that time, the tanking cars will have already been rolled up to the pad and hooked up to Ground Support Equipment used to deliver propellants to the Soyuz launch vehicle, loaded via the various umbilical masts connected to the different stages of the rocket to deliver propellant, pressurant and electrical connectivity. 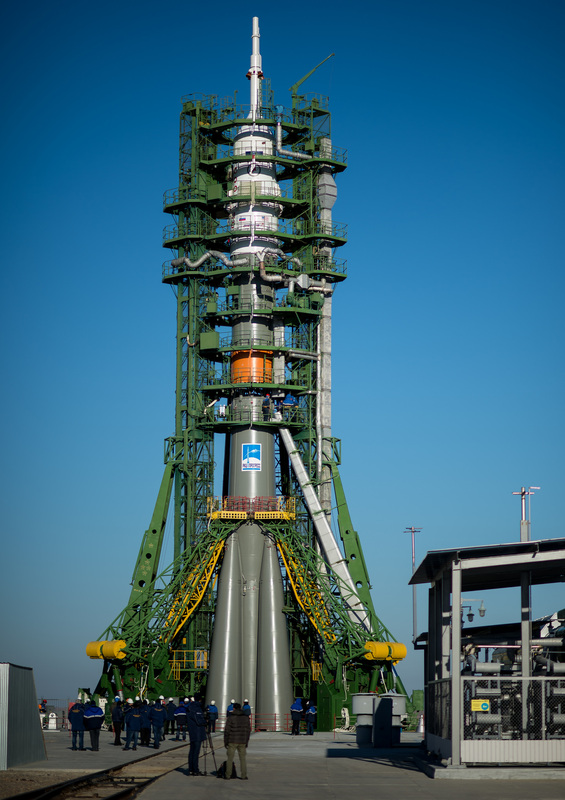 Soyuz FG stands 49.5 meters tall and weighs 305,000 Kilograms when fully fueled. It can lift up to 7,200 Kilograms into Low Earth Orbit using a two-stage stack plus four liquid-fueled boosters clustered around the Core Stage. The Core Stage is ignited with the boosters and continues to burn after the boosters separate, acting as combined first and second stage. It is 27.8m tall and 2.95 meters in diameter with a total launch mass of 99,500kg. The core is powered by a 990-Kilonewton RD-108A engine and four verniers for vehicle control. Around L-3.5 hours, the crew will depart Site 254, reporting to officials and boarding a bus for a one-hour ride to Site 31/6 that normally supports Soyuz missions with satellites and Progress cargo craft but has been called up three times in recent years to launch crewed Soyuz craft. Getting off their bus, the crew members will have a look at their fully fueled rocket, take a few photos with officials present at the pad and walk over to the Service Structure stairs to wave good-bye and enter the elevator taking them up to their Soyuz for crew ingress. Climbing into the Soyuz through a hatch inside the Launch Shroud, the crew members will – one by one – enter the Orbital Module through its side hatch before climbing down through the Entry Module’s hatch to reach their Kazbek seat liners in the confined space of the small spacecraft that the crew has to share with cargo and equipment. 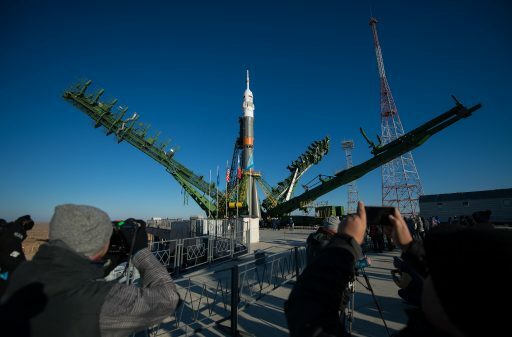 Leak checks on the spacecraft pick up as soon as Soyuz has been sealed off and the crew will begin working through their pre-launch checklist that will take them about one hour to complete. 60 minutes ahead of launch, the Guidance System is activated and the flight computers receive their flight software 15 minutes later. As hands-on work at the pad wraps up, teams will retract the two halves of the Soyuz Service Structure at L-40 minutes and put all ground systems in a safe configuration. Half an hour before T-0, the Launch Abort System will be activated and switched to automatic mode. 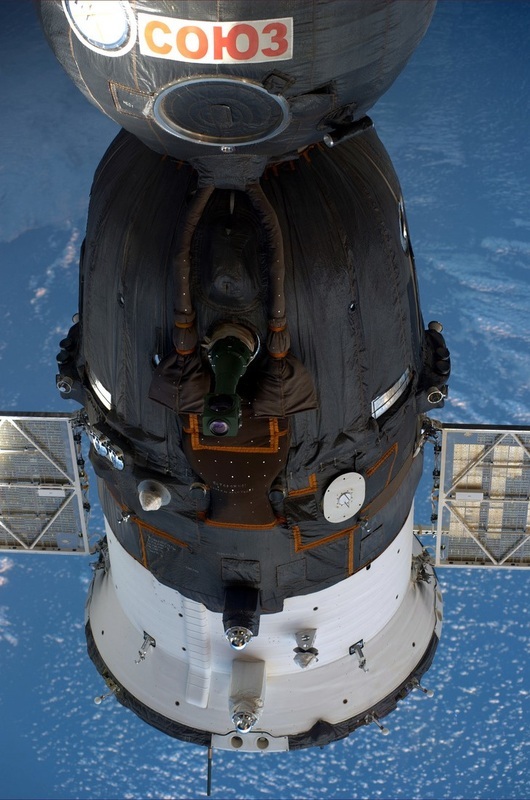 Soyuz telemetry systems are activated at T-5 minutes and the Commander Controls inside the Soyuz become active. At that point, the crew members will have closed their helmets and switched to suit air. Blastoff is set for precisely 8:05:14 UTC, the optimized launch time based on the latest tracking data of the International Space Station. As clocks hit zero, Soyuz will begin rising from its launch pad with a total launch thrust of 422 metric tons, embarking on a nine-minute ascent mission following the usual flight profile. With the boosters tumbling away from the Soyuz rocket, propulsion will only be provided by the Core Stage’s engine, delivering a thrust of 101,000 Kilogram-force. Two minutes and 33 seconds after launch, Soyuz will be over 80 Kilometers in altitude and jettison its protective Launch Shroud giving the crew a view outside through their small Entry Module windows, but the crew members will be focused on their displays, tracking the progress of their ascent into orbit. Four minutes and 45 seconds into the flight, the Core Stage will shut down its engine, marking the beginning of the hot staging sequence. Two seconds after cutoff, the third stage’s RD-0110 engine will be commanded to ignite. 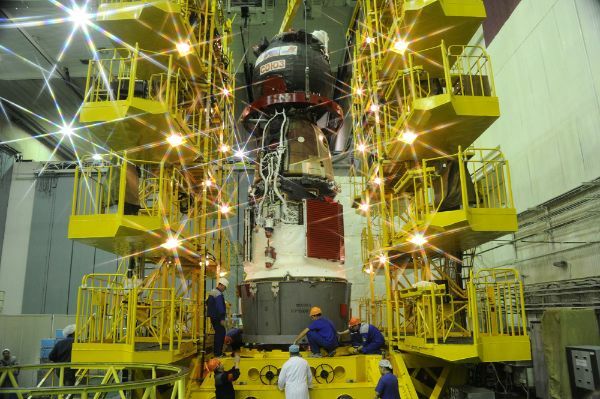 At the same time, pyrotechnic bolts in the interstage will be fired to severe the connection between the empty Core Stage and the upper stage of the Soyuz that will continue powered ascent while the core heads towards re-entry and impact 1,550 Kilometers downrange from the launch site. Following spacecraft separation, the Soyuz will put a series of pre-programmed commands into motion to deploy its two power-generating solar arrays and KURS antennas. Immediately after spacecraft separation, Soyuz MS-02 will go through a series of systems checks, pressurize its propulsion system manifolds and enter a stable three-axis orientation. Mission Control will complete a status check and provide the crew with a GO to open their helmets and get out of their seats to ingress the orbital module. Since Soyuz MS-02 uses the conventional two-day approach to ISS, the timeline for the crew will not be as packed as it would be for the four-orbit rendezvous. 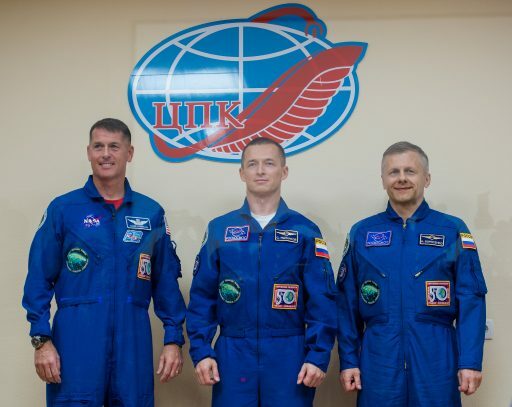 After a series of initial reconfigurations to transition the Flight Control System from launch mode to its free flight configuration, the crew members will get out of their Sokol launch and Entry Suits and set up the orbital module for their two-day commute to the Space Station. 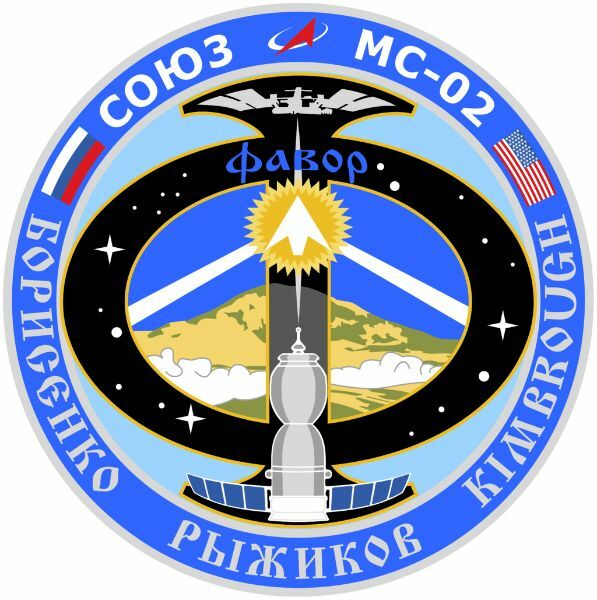 Soyuz MS-02 will receive an update on its orbital parameters during the mission’s first ground station pass following the completion of the first orbit. During the third orbit of the mission, Soyuz will conduct a pair of engine burns, separated by about half an orbit, aiming for an orbit of 260 by 348 Kilometers to place the Soyuz in the proper orbit to catch up with the Space Station. Another engine burn will take place during the 17th orbit of the mission to put the Soyuz in the appropriate orbit taking it to a position from where it can enter its Automated Rendezvous Sequence. The Automated Rendezvous Sequence will be initialized at 07:34 UTC on Friday. 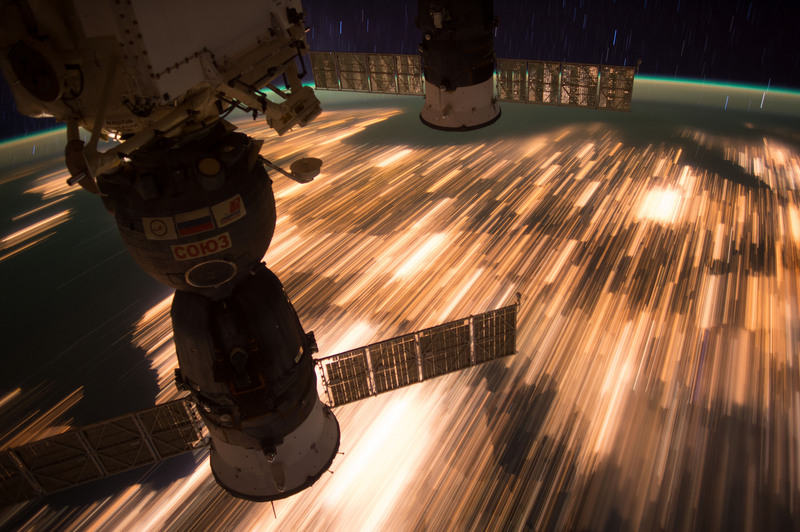 During the Rendezvous Sequence, the Soyuz will complete more engine burns to link up with the Space Station. 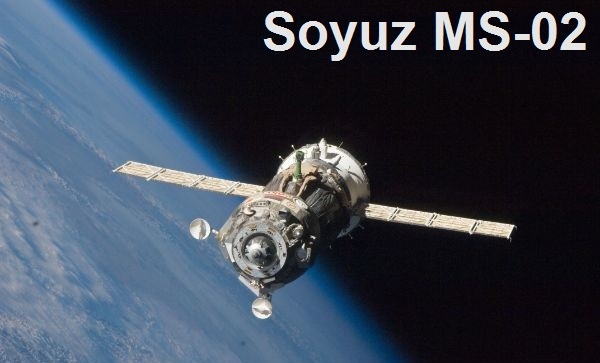 A two-way voice and proximity communications link between ISS and Soyuz will be established and the Space Station will hand to Russian Attitude Control. 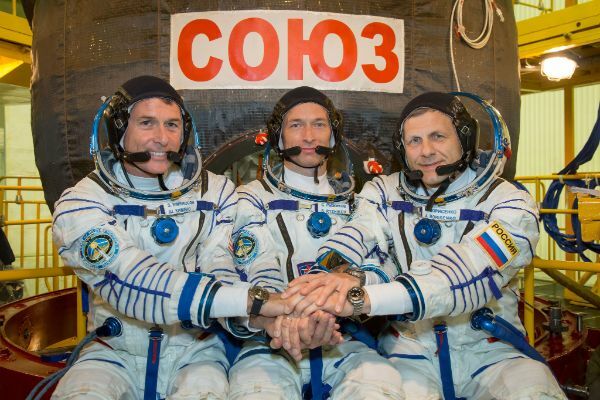 Performance of the KURS radio navigation system will be verified as part of the standard short test to make sure the system is providing good navigation data to the Soyuz. Once entering the vicinity of ISS, the Soyuz activates its TV system and performs a number of rendezvous impulses with its small DPO thrusters to get ready for the Flyaround Sequence starting at a range of 400 meters at 9:35 UTC. Making a slow lap around ISS, Soyuz MS-02 will line up with the Poisk Module. At a distance of 180 meters, the approach will be stopped for a short period of Stationkeeping to give mission controllers a chance to verify good alignment and perform a short systems check. Once the command for final approach is sent, the Soyuz fires its DPO thrusters to initiate a gentle closing rate. During final approach, Soyuz retracts one of its KURS antennas and keeps itself aligned with the docking port. Contact & Capture is expected at 9:59 UTC (+/-3 minutes) after what is hoped to be a fully automated approach..